The revolutionary EPFX-SCIO and INDIGO Biofeedback Devices were created by Professor Bill Nelson of Hungary over a period of many years of research and development to combine holistic medicine with advanced quantum technology. These powerful biofeedback devices makes it possible to query the body for its most acute and chronic conditions or needs and attempt to balance or correct these stressors with focused energetic therapy. The main premises of quantum biofeedback therapy are that the body is electrical in nature, that it is innately intelligent, that it has the ability to heal itself if the right conditions or stimuli are provided, and that as the client becomes more aware of that which has been unknown to them, they can make changes to improve their wellness. The EPFX-SCIO and INDIGO scans the body for 9000 frequencies, each associated with a different compound, much as anti-virus software would do for a computer. The EPFX-SCIO and INDIGO operates at biological speeds (up to 1/1000 of a second) charting the resonance or response of the body to these frequencies, comparing them to a norm and ranking them in degree of reactivity, identifying both acute and chronic imbalances. Clients can then be provided information about the results and energetic therapy can be given to attempt a balancing or harmonizing of any aberrant frequencies. Offering over 200 biofeedback therapies in 72 modalities, it is the largest healthcare software package in the world, combining both eastern and western philosophies and techniques. Quantum Biofeedback equipment includes a laptop, the EPFX-SCIO or INDIGO, head harness, and limb straps. 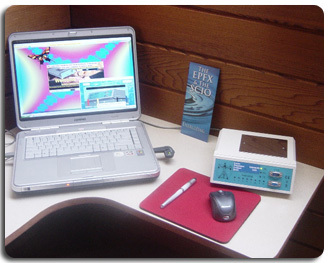 An initial session with the EPFX-SCIO and INDIGO takes approximately two hours, which allows for the completion of the intake form as well as the Suppression and Obstruction to Cure or "SOC" panel, which identifies lifestyle issues and medical history and helps cue the biofeedback device to any particular risks for the client. It is an overall value calculated by the device to reflect the client's impediment to healing. The lower the score, the fewer impediments to healing. Once the SOC panel is completed, the client is connected to the EPFX-SCIO and INDIGO with a head harness and limb straps. The device is then calibrated and the test scan proceeds for about four minutes, measuring the resonance or response of the body to the 9000 items (including minerals, vitamins, toxins, allergens, viruses, pathogens, organ functions, etc.). When the test is complete, the practitioner reviews the highest risk items and begins to attempt correction of priority conditions. This process usually begins with balancing of minerals, vitamins, and organs to better enable the body to begin healing. The more specialized therapies can then be utilized as appropriate and a strategy for future sessions can be developed in consultation with the client. Follow-up sessions are approximately one hour and involve a review of the "SOC" panel to determine if there have been any lifestyle or symptom changes to report. Once this is accomplished, the session proceeds as before, continuing therapy according to the client's needs and the wellness plan established after the first session. No claims are made of the EPFX-SCIO and INDIGO systems or its results and nothing that the EPFX-SCIO or INDIGO Practitioner does, diagnoses or treats any illness or disease nor replaces any other treatment. Please consult your family medical doctor for the diagnosis or treatment of disease. Please also consult your family medical doctor before undertaking any health program.